Just over three weeks before the start of the new racing season, the Astana team has suspended Kazakhstan rider Andrey Kashechkin from all competition. Details are currently scarce, but the team has made clear that the rider cannot compete until the issue is resolved. “Pro Team Astana will provisionally suspend rider Andrey Kashechkin, effective immediately, for failure to agree to the squad's internal regulations,” it said in a statement. The 32 year old became part of the team in 2006 when the previous structure, Liberty Seguros – Wurth, disintegrated due to Operacion Puerto. Alexandre Vinokurov received backing from the Kazakh government under a new team title Astana and the team continued from that point onwards. Both he and Kashechkin were unable to take part in the 2006 Tour de France but went on to ride strongly in the Vuelta a España, where they were first and third overall. The following year both were suspended due to positive tests for autologous transfusions. 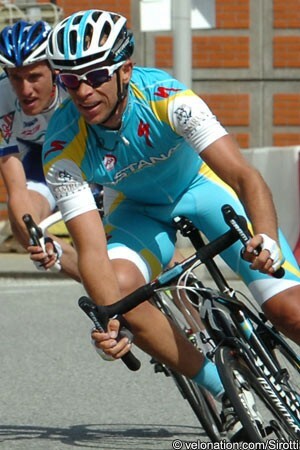 Kashechkin returned to competition in 2010 with the Lampre Farense Vini team and moved back to Astana prior to the 2011 season, where he has remained since. His future with the team now appears linked to his acceptance of the internal regulations. It is unclear if this relates to anti-doping measures or another issue.